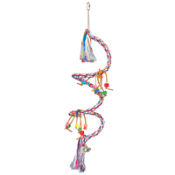 A coconut half with vine stars, square sparkle beads, bear and drop charms all provides shade on this wonderful small bird swing. 10" high. An original Feathered Addictions design. ?